What kind of feelings does the word cannibalism arouses? Well most of us would get disgusted, but there are people who follow cannibalism in India even now. India land of oldest society, oldest civilization, but all this time in the Indian history there was a sect dedicated to Shiva was involved in cannibalism and other very crude animal behavior. The aghori or aghouri sect has its origin in ancient Vedic system, even though these people don’t follow the main stream Vedic system but the root is the same. The word aghori in Sanskrit means non terrifying, ‘a’-‘ghori’ most of the Hindi speaking people would have heard the phrase ghor kaliyug, ghor paap, etc.. it is the same ghor, theoretically these people don’t attach themselves to anything mortal. They do things which a common man finds to be terrifying, so they overcome this terror by going through it, since they do it regularly it is a common thing for them. drinking liquor in a kapala(skull cup). In Hinduism, “there is no evil, everything is emanated from ‘Brahman’, so how could anything in this universe be impure”? this is the kind of philosophy the aghori babas follow. According to them anything in this universe is the manifestation of god itself, so everything is as pure as god and is god like, so abandoning anything is like abandoning god itself. The aghori mainly worship lord Shiva, according to the sect every human is a ‘shava’(dead body) with emotions and they should try to become ‘Shiva’ by denying the human pleasures and involving in the aghori rituals. The root of aghoris are as old as Hinduism itself, but the sect in its present form has its origin in Kinaram, he was an aghori ascetic and lived for about 150yrs. He was believed to be the incarnation of lord Shiva. He attained many siddhis through tapas and rituals and then helped the people with his siddhis. There is a temple in Varanasi for this baba and is the most sacred for the aghoris. Some also trace the root to Dattatreya. 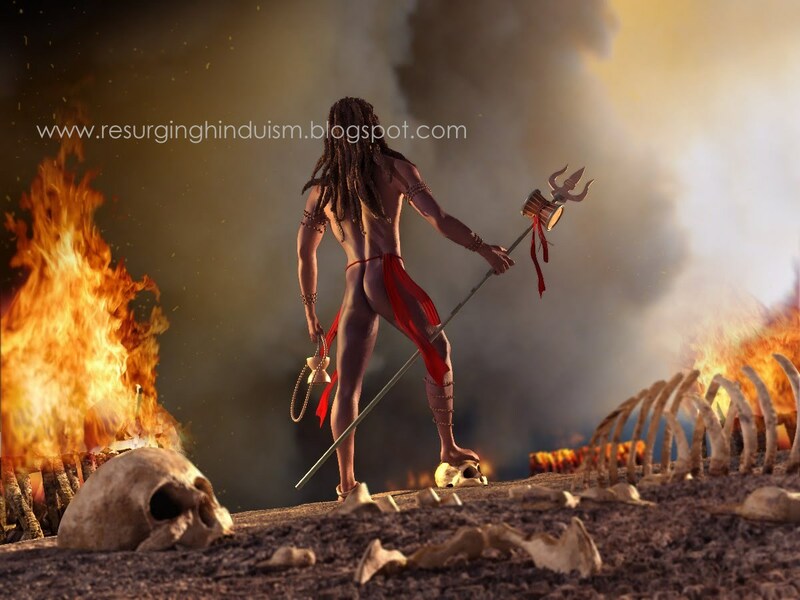 The aghori is a human symbol of lord Shiva himself. The aghori lives in cemetery (shmashana), the living place for lord Shiva, this is the representation that the final abode for everyone is the cemetery. And many of the aghoris roam around naked, representing the true humans and their detachment from this world of mortals who live in the world of illusion. By this they transcend beyond human feelings of love, hatred, jealousy, pride etc.. 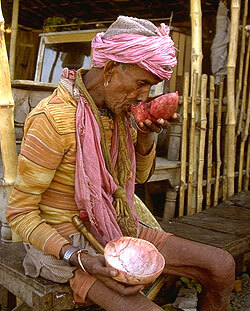 There are many aghoris walking the streets of northern India with kapala(skull cup). These aghoris eat anything, when I said anything, it really meant anything like rotten food, food from the dumps, the animal faeces, animal urine.. etc they regularly perform rites(some are so crude that it cant be explained here) to attain the highest level in aghoratva, the enlightenment. The final part of the ritual requires a minimum of one eating of putrid human flesh, and also meditating on(sitting) the dead corpse. This is the symbolic of their rise from shava to Shiva. They follow the simple rule that the universe resides in them and they try to attain enlightenment by self realization. As the ascetic advance in his search, he attains many siddhis. Slowly they gain control over the environment. They seem to posses powers to cause a rain or to stop one. This is disturbing but this is true, even though they possess this kind of powers they will not use it, for the basic rule of aghori itself is to deny human pleasure so the change in climate is an event which should happen on its own. Whatever the ascetic says happens, I have met people who have had direct relation with the ascetic, and I cannot question the veracity of the datas. It is also said that when he curses someone, every wish of the person comes true. There have been many aghoris in the past. Some of them being Dattatreya, Kinaram, Tailanga swamy, Aghoreshwar Mahaprabhu Baba Bhagwan Ram. same night, Shiva appeared in a dream to the king of Benaras and told the king about his anger since someone insulted Tailanga Swami, who's Shiva's very essence. The King then set out to find the priest and punish him, but the priest was mysteriously found dead. This refers to an incident which a man narrated to Ambar joshi about an Aghori Baba who lived in Burhanpur (near Khandwa, MP).This is what he narrated---There used to be an old Baba .People used to call him Dhuni wale baba. Now there is a samadhi of Dhune wale bab in Khandwa whre people still throng in large numbers to worship him.He used to stay ther and roamed the adjoining areas ,use to eat whatever came his way- rotten food or thrown away food .He used to utter obscenities if anyone talked to him or disturbed him even while he seemed to be doing nothing. He used to stare into the sky for hours and talk to himself. One day i saw a person come up to him and touch his feet and ask him to bless his daughter who had not been married in spite of their best efforts. The Baba uttered obscenities on him. Cursed his mother and family members and said that his daughter would go to hell. Then the man went away contented and after three days he came with some sweets and gave to the Baba who again uttered obscenities on him. I intercepted him on the way back and asked him why he respected a useless mad old man. The man remarked he is a great Baba and has cured many peoples problems. If he curses you then your problem is bound to get solved. Aghori Babas are like that he said and offered me a piece of burfi(An Indian sweet)which I gladly ate. Then I saw many other instances when the Baba uttered obscenities, people used to still go behind him even while he used to answer the call of nature. He used to throw his faeces all over people who came behind him and they used to collect it and take home as prasad.(holy). Maldevta is a popular picnic spot near Dehra Dun. Thirst overtook us while trekking to Maldevta and we decided to ask for some water at a small thatched hut about a eight hundred scrubby hundred yards from the canal we were following. A dusky, well built man wearing a skimpy loin cloth emerged from the dark interior of the hut. Why, of course, we could have water, he answered. He didn't have that much left, just a couple of glasses, as he'd just finished cooking, but we were most welcome to it. Was this his permanent residence, we asked him conversationally? Oh no, he had no fixed place of stay. There was a cremation ground just a stone's thrown away, and he'd built this hut as he had been waiting for a lawaris body (homeless person's body which is generally cremated by a philanthropic organization or trust). As luck would have it, after waiting for some three months, such a body had arrived just yesterday, and he'd been able, in exchange for a good luck charm, to obtain the head of the dead man. In fact, he'd almost run out of water as he had used most of it for cooking the dead man's brain with some rice. He brought out a blackened pot and showed us the contents. He'd already had one portion of it, and would have to space out eating the cooked brain and rice over the next three days. Repelled, chilled, yet curious, we asked him who he was. He was an aghori, he said, and Calcutta was his birthplace. After early initiation when he was just nine years old into Tantric Kali worship, he'd moved into other deeper sadhnas (disciplines), but always, it was with the forces of the dark. The rules and demands of the search for power in which he was now engaged ordained that he had to eat at least one human brain annually. Already, he had acquired the ability of divining the future. He could actually show us our future, in case we were interested. Why didn't we come in? Fascinated yet afraid that at this isolated spot we might end up becoming his annual meal, we left somewhat hastily, forgetting all our lessons in politeness. Over the next few days, I couldn't get the aghori out of my mind. When a brigadier and his wife came to seek a reading from the cards as they were in deep trouble with a court martial looming on the horizon, it gave me the opportunity to go back to the aghori, with the anxious brigadier and his wife in tow. After all, he had said he could show one the future. What better way of testing the claim ? He was still there, at the peak of his powers, he informed us, as he'd recently consumed the human brain. This time, we entered his hut and our eyes soon became accustomed to the dimness. The aghori requested us to sit, and as we sat cross-legged on the earthern floor, placed a lota (container) of water before us. "Look into the water" he commanded. And in the water, we saw the brigadier, older, dressed in civilian clothes. After several sequences, we saw the brigadier with the Supreme Court clearly visible in the background, and he was wearing a dark blue suit and distributing sweets to a group of people who were with him. Some months after this amazing incident, the brigadier wanted to take a friend to meet the aghori, but when we reached there we found the hut in a sad state : it was just a bundle of grass and straw and twigs strewn on the ground. Enquiries at the cremation ground revealed that the aghori had been driven away by irate residents of Raipur, a nearby suburb. Seven years passed with only occasional meetings with the brigadier, who was no longer in active service and was fighting his case in the civil courts. One day I received a message from him. The Supreme Court was to give the verdict on his case. 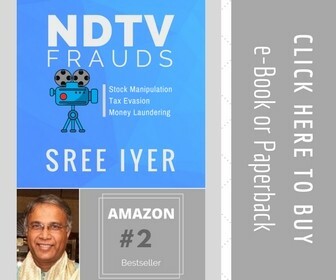 And when I went on the appointed day, apart from other settings, there, outside the imposing Supreme Court building, was the Brigadier, dressed in a dark blue suit, distributing sweets just as he had been seven years ago in the lota of water the cannibal aghori had placed before us. Philosophy behind this: Aghoris are indifferent to everything. For them there is nothing good ,ideal or bad. Everything that exists in this world is essentially made up of same thing. Hence they utter obscenities, may take liqour, eat Dead human flesh and do other things which might appear to be 'uncivilised' to us. We should respect the way chosen by these people for enlightenment. After all lord shiva is also an aghori, yes it was his another name. Many people think that aghori babas kill humans for their rituals, but there is no strong evidence for this. 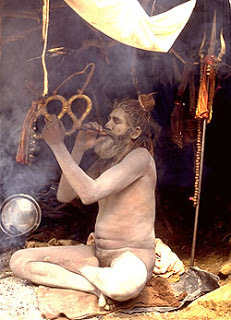 Since this sect has most of its rites and rituals a secret, we don’t have exact number of aghoris present in India, but you can always find few aghoris in the Kinaram aghori temple in Varanasi.